Best Digestive Enzymes – All Vegetarian is a uniquely formulated, full-spectrum high potency digestive enzyme blend created to complement and support the body’s own digestive capacities. Each capsule provides the body with enzymes designed to optimally aid the digestion of fats, proteins and carbohydrates present in cooked and raw food. * The formula supplies the added support of alpha- galactosidase and beta-glucanase to break down vegetables, beans and grains, and enzymes such as glucoamylase and invertase to assist with the digestion of sugars. 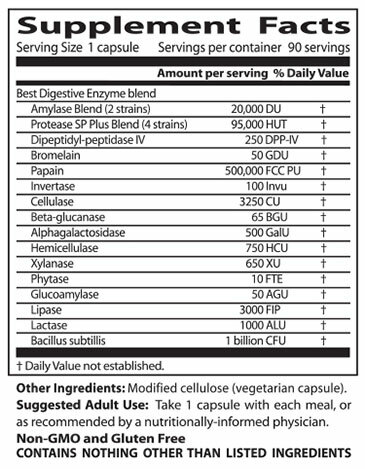 * In addition, this complete formula contains friendly bacteria to uniquely promote optimal intestinal health. Suggested Adult Use: Take 1 capsule with each meal, or as recommened by a nutritionally informed physician. Digestive enzymes are produced by the pancreas and secreted into the duodenum (upper small intestine) where proteins, carbohydrates, and fats are broken down prior to absorption. The body's capacity to produce enzymes may decline with age. Moreover, stress and other unhealthy lifestyle factors may impact enzyme production. Overeating sometimes causes incomplete digestion. Occasional heartburn, bloating, belching, discomfort, and a "sour stomach" are often a result of this. 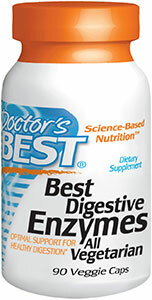 Supplementation with the enzymes in Best Digestive Enzymes supports replenishment of the body's enzyme levels, promoting healthy digestion and delivery of vital nutrients to the body. Maintenance of healthy digestion not only helps with occasional gastrointestinal discomfort, but also supports the very integrity of the intestinal mucosa (the lining that comes in contact with food and bacteria). Additionally, enzymes may enhance healthy bacterial balance in the bowel by lessening the accumulation of undigested foods in the large intestine. Best Digestive Enzymes contains microbial-derived enzymes that have a long history of research and use in Japan and in Europe. In fact, research on such non-animal source enzymes for purposes of health maintenance has been conducted since the 1950’s in Europe and Scandinavia. Scientists there were the first to report on the isolation and purification of individual enzymes from microbes such as Aspergillus oryzae and others. They also were the first to publish reports on the use and efficacy of various microbial enzymes for therapeutic purposes in studies on animals and humans. Microbial-derived enzymes have distinct advantages over animal- sourced enzymes (such as pancreatin), and supplementation with them has proven more effective at supporting the digestive physiology of the human body. Animal-derived standard enzyme preparations are active only in a small pH range and the activity of these enzymes is destroyed by acidic conditions in the stomach. By contrast, microbial-derived enzymes have higher activity levels (less enzyme is needed for the same purpose) and are active over a wide pH range, with some reports showing activity from pH 2 to 10. This means that while over 90% of animal-derived enzymes may be inactivated in the stomach and be useless for digestive purposes, microbial-derived enzymes would begin digesting food in the acidic conditions of the stomach and continue this process well into the small intestine, increasing the efficiency of the digestive process. Alpha-galactosidase – An enzyme that facilitates the breakdown of carbohydrates such as raffinose and stachyose. This enzyme is especially helpful in supporting the digestion of raw vegetables and beans. A study published in 1994 showed that alpha-galactosidase supplementation was effective at reducing indigestion and flatulence in healthy individuals consuming a high-fiber diet consisting of grains, beans and other vegetables. Protease – This enzyme supports the digestion of protein and proteincontaining foods, breaking them into absorbable units of amino acids, the building blocks for the body’s regenerative purposes. Lipase – The main enzyme that functions to break down lipids and improve fat utilization. In this capacity, it supports the function of the gall bladder. The microbial-derived lipase used in this formulation has been shown to have much higher activity levels than animal-derived lipase enzyme, enhancing the efficiency of fat digestion. Microbial lipase is resistant to inactivation by stomach acid and can digest dietary fat beginning in the stomach and continuing into the small intestine. In an animal study, researchers demonstrated that a microbial-derived lipase was as effective at digesting fat as a 25 times larger dose of conventional pancreatin. Bacillus subtillis – Although this bacteria is not known to be native to the human digestive tract, supplementing with this important probiotic organism promotes a healthy bacterial balance in the intestines. Probiotic organisms have been researched for their ability to support healthy immune function, efficient digestion and the general health and well being of the digestive tract. The nature of the digestive process in the human body is such that it is highly energy-intensive. The pancreas is the organ that produces most of the digestive enzymes required for food breakdown and secretes them into the small intestine. The lower the efficiency of digestion in the stomach, the higher the requirement for newly manufactured pancreatic digestive enzymes. This process can place a burden on the pancreas, which may, in turn, place a large burden on the rest of the body. If the pancreas is working overtime to support our body’s digestive process, it is diverting crucial resources from normal repair functions the body may need to perform in diverse organs and systems. However, the body has developed a compensation method for dealing with this undue burden. The body smartly recycles enzymes that it produces as the unused portions enter the bloodstream into systemic circulation. Research has shown that this recycling is facilitated by pancreatic secretory cells themselves. These cells, which normally secrete enzymes produced by the pancreas into the small intestine, serve as collectors of unused enzymes that are circulating in the blood stream and can then re-secrete these enzymes into the intestines when needed for digestion. This reduces the burden on the pancreas to produce newly manufactured enzymes in increasingly large amounts. Of particular interest is research showing that this mechanism is used by the body not only for endogenous enzymes (those produced by the pancreas) that are in circulation, but also for exogenous enzymes (such as those from supplements). Supplementing with enzyme formulations containing a full-spectrum of digestive capacity, such as Best Digestive Enzymes, can reduce the need for the pancreas to manufacture enzymes and reduce the need for the body to devote large amounts of resources for this purpose. This frees up the body to devote its energies to the daily maintenance of other critical bodily organs and systems, potentially maintaining and enhancing overall health. See more at the manufacturers website - click here.